Rich, dark hot cocoa made with good dark chocolate, honey, vanilla, and a cinnamon stick for good measure, and livened up with a nice dose of dark amber rum. Preferably sipped next to a roaring fire. It’s quiet, relaxed, and lazy in our home right now. The mayhem of Christmas is behind us, but birthdays and New Year’s are just around the corner … which means things are going to be crazy again before we know it. So for these next couple of days, I’m going to dig my fuzzy-slippered heels in and keep my flannel PJ pants on as long as I possibly can. And just, you know, lounge. Aaaah. 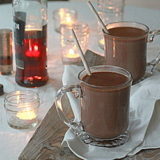 Lazy afternoons and evenings are the perfect time for hot chocolate, but not just any hot chocolate. 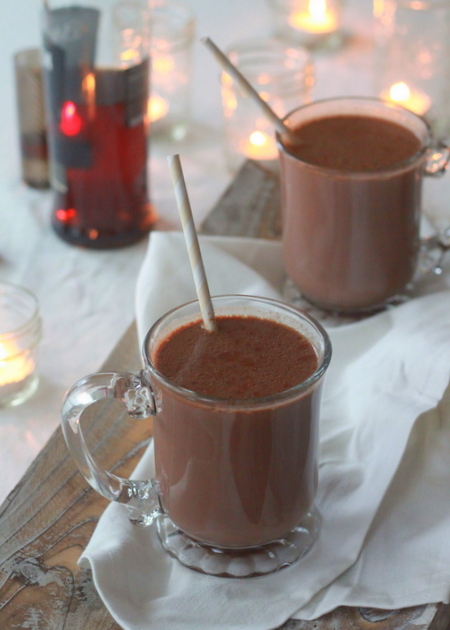 Boozy hot chocolate. 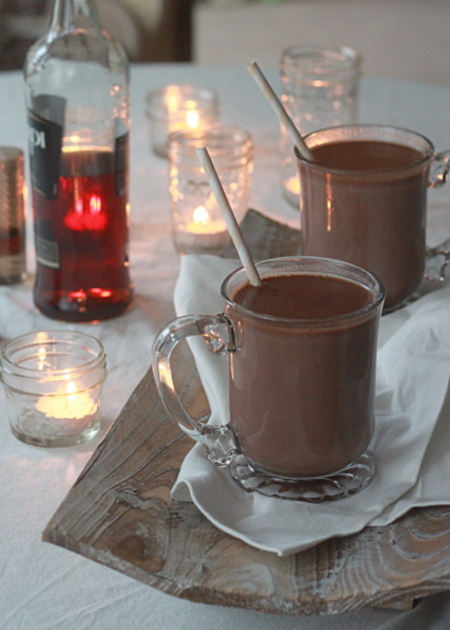 The best thing about this glorious boozy hot chocolate is that it’s as perfect for uber-relaxed days as it is for a lively New Year’s Eve party. Just imagine watching the fireworks from your rooftop garden with a steaming mug of perfectly spiked hot chocolate cupped in your hands. I would like a rooftop garden with a view of the fireworks. Or a friend with a rooftop garden with a view of the fireworks. Oh hey. Do you happen to have a rooftop garden with a view of the fireworks, and if so, can I finagle an invitation to your party?! I’ll totally bring the hot chocolate. 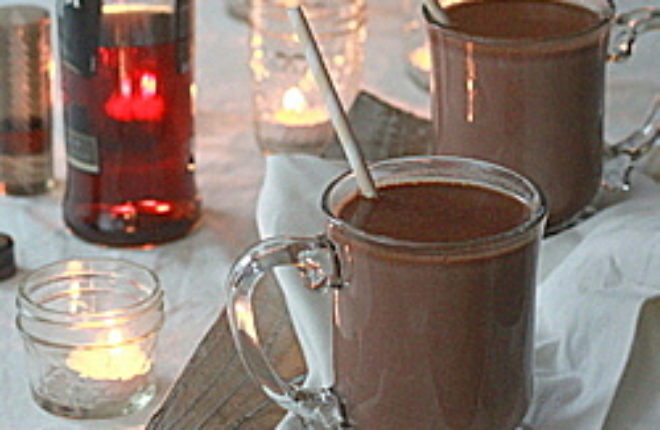 In a medium saucepan over low heat, combine the milk, chocolate, honey, and cinnamon stick. Stir occasionally with a whisk or wooden spoon until the chocolate has melted and the mixture is steaming hot. Remove from heat. Remove cinnamon stick and stir in the vanilla and rum. Oooh, yes – Baileys kind of belongs here, doesn’t it?! Thanks! I actually kind of cringe when I look at the photos. We are our own worst critics! I am *so* missing the summer light. Starting to experiment with new areas in the house … the garage will be my last resort. 🙂 Happy New Year, Averie! I’m SO into this! 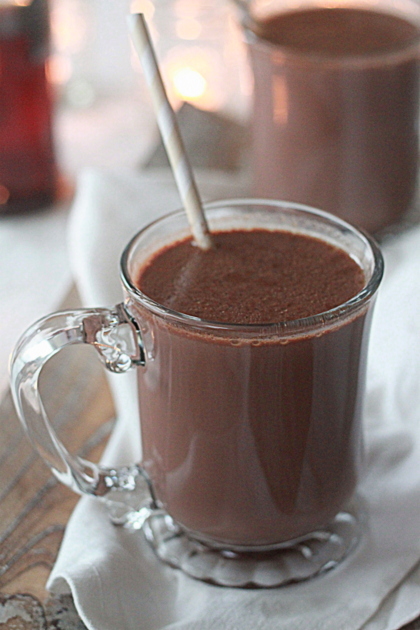 I’ve been adding coffee liquor to my hot chocolate just about every single night this season. deLISH! Exactly what I was looking for! Thank you for the inspiration!